I had the need to connect from the command line recently, and decided to make a quick post on using SQLCMD, as I had an issue. 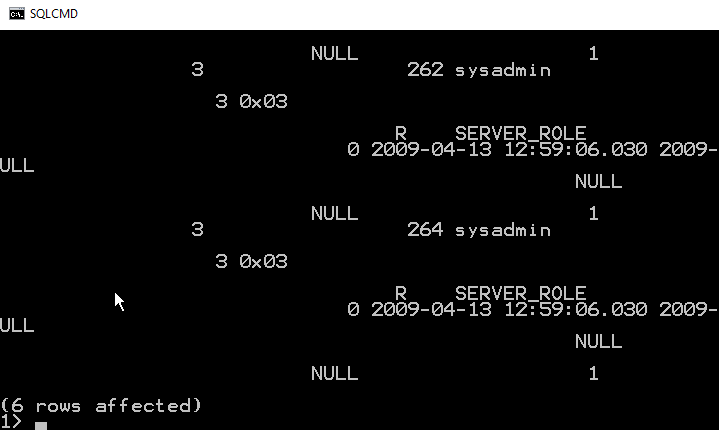 SQLCMD is a command line utility that comes with SQL Server. I know many people don’t use command lines, but they are handy at times. I recently opened a command prompt. The issue here is that I don’t have a default instance on this machine. All of mine are named. I need to provide a –S parameter, with a server name (and possibly instance name). I do that and I’m connected. By default, SQLCMD (and osql) try to use Windows Auth. The 1> indicates that the utility is ready for T-SQL queries. You need to know your language here as there’s no help. I can use this to make my code easier to read. I can format code as I would in an editor, though be aware you can’t go back and edit previous lines. As you can see, using SELECT *, or retrieving too many columns make results hard to read. You would to wise to pick only those columns you need to return. To leave SQLCMD, you can type exit, which will return you to the command prompt. This is a short look at SQLCMD. The older, osql, utility functions the same way, and both are good, lightweight ways to connect to your SQL Server instance. This entry was posted in Blog and tagged sql server, SQLNewBlogger, syndicated, tools. Bookmark the permalink. Great article Steve. One thing you might find useful is if you type :ed it brings up the curent command buffer (everything since the last GO batch separator) in notepad. I think if you do it immediately after a batch it loads the last batch you sent. Note I have no idea about how to get that working with the new ubuntu subsystem on windows 10. That assumes the regulat windows build of vim. Thanks, I’ll play around with those. I’m trying to decide what editor i want outside of SSMS. I may go with notepad++, though I don’t love it. If you do go notepad++, poor mans t-sql formatter is a great plugin. Thanks, that might be the thing to try. I use Sublime and Edit Plus, but don’t love them for SQL.